Tonya & Bajenk's: Born 05-20-2016. This should be a wonderful litter, with beautiful, outstanding, versatile hunting dogs, and fantastic family dogs. Both parents are beautiful liver patched and roaned. ​Tonya is a wonderful girl with a great loving temperament. She like all of our dogs has a great point, back, and is a close to medium range hunting dog. She loves the water and has a nice natural retrieve. Bajenks is a wonderful loving and handsome boy. He is big and powerful but loving like a puppy. 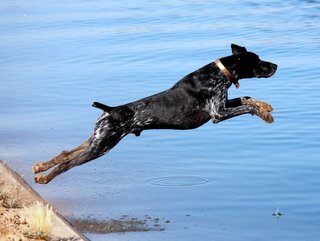 He loves the water, retrieves to hand, points and backs, and hunts for the hunter. He is an outstanding boy in every way. He is the son of David, and grandson of Jack and Dolly. I like his breeding and how much he is like dad and granddad. Pup at 4 days before roaning. Roaning is when the light hairs mix with the darker hairs to produce a graying effect. 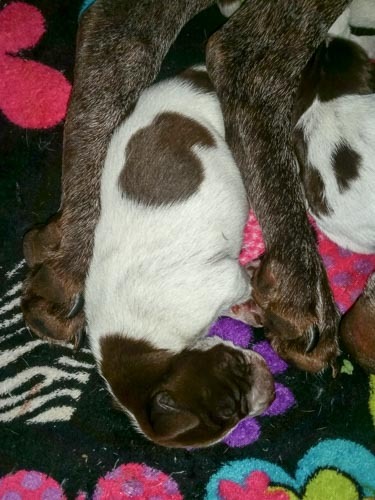 All the puppies should be a very dark pretty liver like mom and dad. 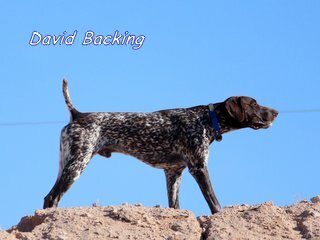 David is Bajenks sire and is one of the very best dogs I've ever seen or hunted behind. A truly once is a life time dog. He can do is all. Loves to retrieve, loves people, loves water, great point and back. Jack is an uncle to Bajenks and simply said is the best dog I've ever owned. The Puppies have an exceptional and Unique pedigree. It would take a few pages to explain this pedigree in detail. There is information on how to read a pedigree on this wed site. Tonya's pedigree is one of the very best I've seen. Ybold Rothenuffeln is one of a very few German Ks and American DC dogs. 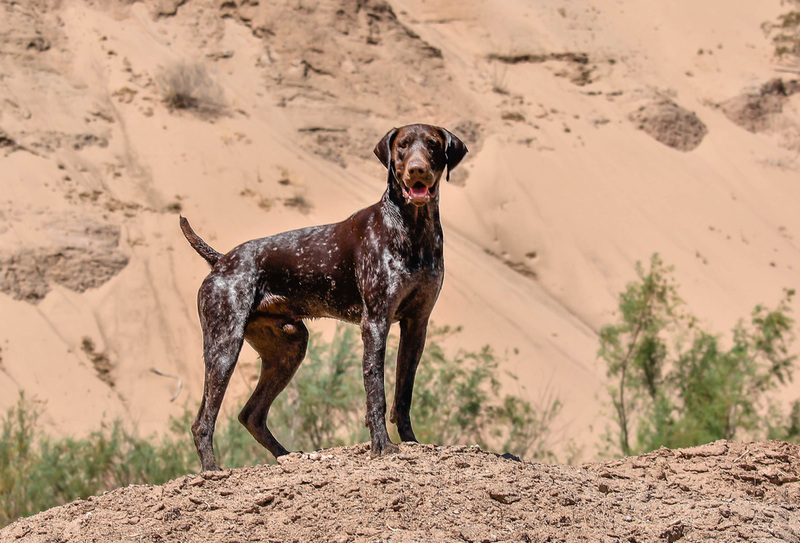 Lot's of DC's, and Ks's in the pedigree and some very outstanding dogs. 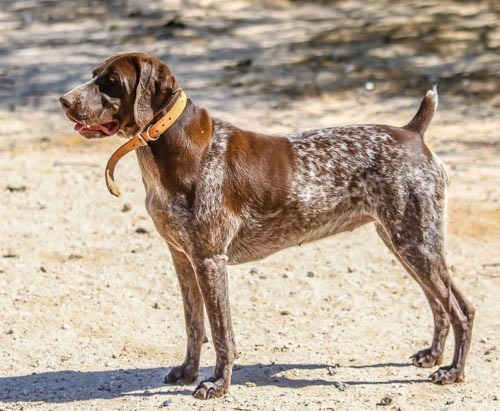 Tonya herself reflects her pedigree and she is an outstanding versatile hunting dog who is very loving. Bajenks reflects our attempt to carry on the outstanding dogs in his pedigree that we have come to know and love. Jake and Jake's outstanding sire Shield, great grouse dogs. Hillbilly Lucky Lacey who is one of our favorite tap roots of our line. The top grouse dog of Grousebuster Kennel, and is the mother of our Jack, David, and Katie, all top versatile dogs in their own right. Our Dolly who was an outstanding girl, who we miss every day. Dolly's sire Bullet who is the top dog at his kennel. Nash Dolly's mother who was an outstanding hunting dog. We have great confidence in this breeding.